It started with sheep. Paula had been experimenting on her permaculture bush block in the ACT. The sheep were part of her strategy towards self sufficiency. Paula’s flock was supplying her with food, but their safety weighed on her mind. She bought an alpaca to guard them…and then bought more, with a few llamas as well. She fell in love with these curious creatures and their range of natural colours. Paula values community and relationships. She smiles shyly remembering the friendly welcome the alpaca community gave her. She appreciated and benefited from their help and advice as she learnt the ropes. 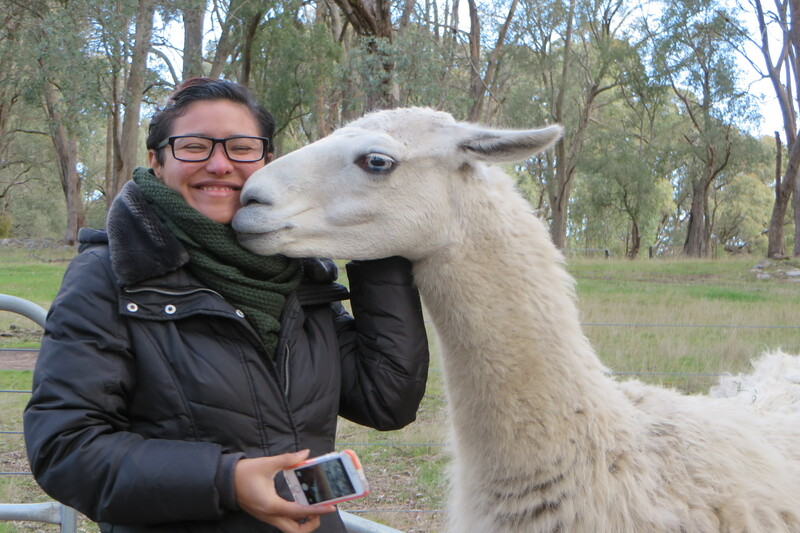 One relationship she’s developed is with experienced farmer Val, at Qozqo Alpacas. Together, they’re able to contract an alpaca shearer to the district each season. With each shearing, the pile of raw fleece in Paula’s shed grew larger. Paula’s hand spinning couldn’t keep up. Something had to be done. The opening of Boston Fine Fibres mill provided the perfect opportunity. Paula sent some fleece over for processing. For colour, Paula looked close to home first. She made her first dye baths with the wattle and native indigo already growing on her bush block. She expanded into experimenting with eucalyptus leaves, bark and mushrooms. She repeats the hues she likes best. Paula’s quiet modesty belies the stunning results of her work. Warm greys, vibrant terracotta, palest olive green and exquisite taupes. At each step, Paula has expanded her skill set. She weaves scarves, and would love to make rugs next. Her current experiment is a merino alpaca blend, working with Millpost merino. Watch this space; if successful, the trial might expand to a new, all local product range. Mirrormere is her passion project, squeezed into weekends and spare time when she’s not at her job in the city. Mirrormere is more than a business for Paula. It’s also about loving her animals and finding a way to use the fibre they produce. Paula has built up an enthusiastic following for her local, traceable products. 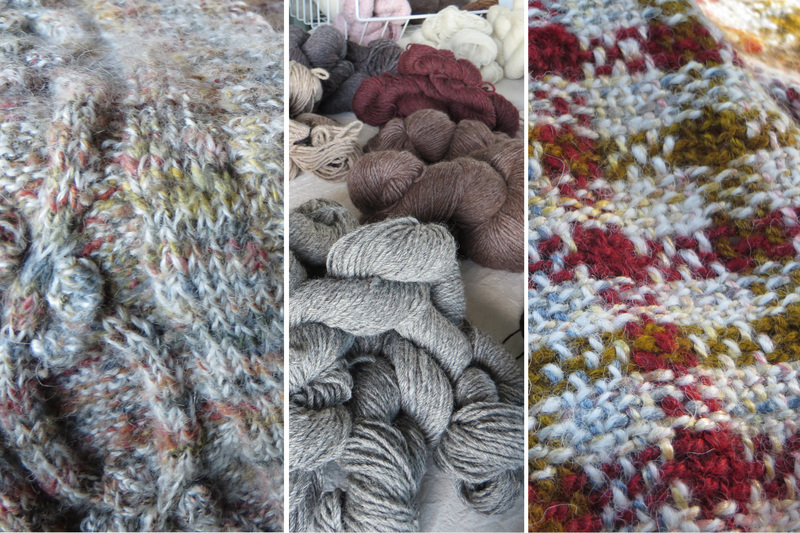 Mirrormere roving and yarns – both natural colours and hand dyed – are available to buy online. Farming principles: local, sustainable and low impact, while aiming for a high quality fibre product. We were noticed within a few seconds of exiting our car. Buddy the labrador bounced delightedly. 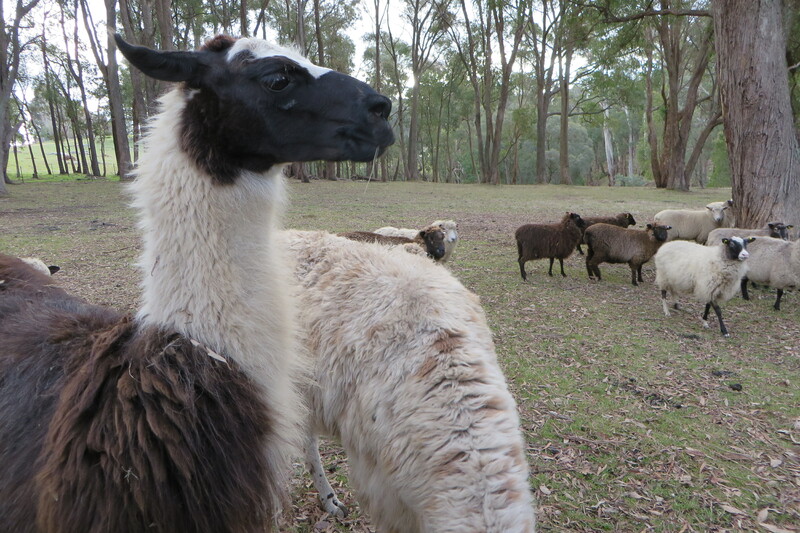 He wagged his tail from a polite distance to welcome us to Qozqo alpacas. Val and John followed shortly with a more sedate, but no less welcoming manner. We sat down to home-baked morning tea as Val told us the story of how they became alpaca farmers. They first kept Angora goats on the property. With foxes a problem in the region, Val purchased some alpacas to guard the herd. It wasn’t long before the easy, inquisitive temperament, stunning colours and soft fleece of the newcomers won them over. Val and John selected their herd based on colour genetics from around Australia. They purchased huacaya and suri alpacas for their colour range and fibre quality. They now supply breeding stock, guard animals and pets locally and overseas as well as raw fleece, processed yarn and hand knitted garments. The show circuit has been an important source of support and encouragement for Val and John with many broad ribbons, including the best grey huacaya in the National a couple of years ago. Befriending a show organiser lead to an introduction to a shearer from New Zealand. Now that shearer stays with them each year when he shears their alpacas, and those of the local district. Val and John pay it forward by helping local alpaca farmers with advice. Val always had an eye out for ways to utilise and value-add to the quality fibre her herd produces. She contracts the local mini mill, Boston Fine Fibres, to spin a range of light weight yarns for sale. She’s gone one step further and drawn together a team of knitters to produce hand made garments for sale. The result is the most exquisite and soft range of products we’ve seen from a farm. Baby clothes and shawls form the largest part of the collection. Given their hand made nature, the garments are priced generously. Val and her knitters challenge themselves with new and interesting patterns. The range of styles, particularly lacework, is testament to their skill. Qozqo’s products are available through local retailers and through their online store. It is worth making a direct enquiry because not all products are listed online. Finishing our cups of tea, we walked over to the pen to greet the alpacas. Newly shorn, their lithe bodies were on show without their usual dense coats. Val and John’s breeding program has resulted in the full range of natural alpaca colours. They have a large herd for Australia, numbering around 300 animals. Val checks the herd twice a day during birthing season to ensure all is well and check out any new arrivals. This is particularly exciting when breeding for grey, because she never knows what will pop out! Val told us she believed a cria had been born a couple of hours ago. We headed into the paddock in the hopes of catching a glimpse. Walking across the paddock, we got our first clear look at the view from Qozqo over the valley. The farm is in an incredibly beautiful setting. 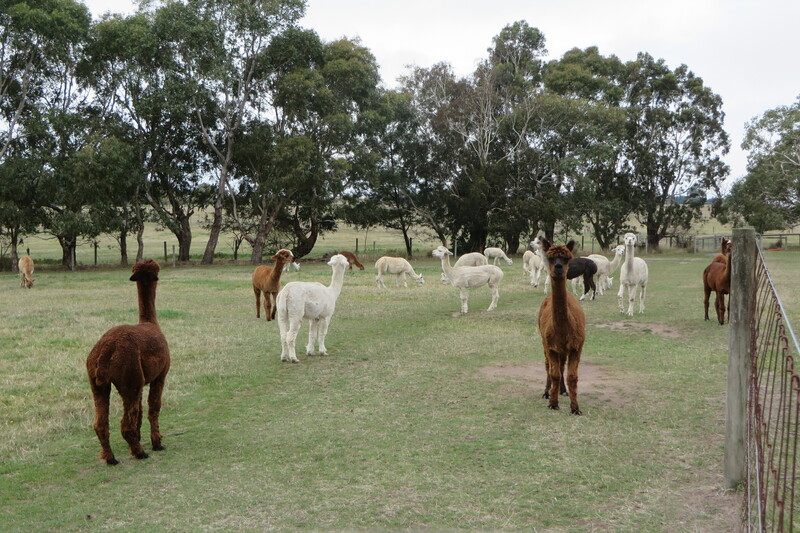 We watched the alpacas form a line as they traversed the paddock. They approached the new mother, each animal stepping up to nuzzle the newborn cria. As we made our goodbyes, the newborn was already gambolling around the paddock under the gum trees. I never expected to find cotton in Victoria. And yet there it was, a news article about the first cotton farm in the state for over 30 years. It is a single crop, but it has been successful. Farmers in the area are paying attention. The cotton is being grown by Kilter Rural, a specialist agricultural asset manager. In other words, investors buy the land, Kilter run the farm. I got in contact with Michael Neville, manager of agriculture at Kilter Rural to find out more. Michael brought me up to speed, revealing facts and statistics so quickly I could barely keep up with my notes. Kilter are growing Bollgard II cotton, which is genetically modified (it’s the 71BRF variety). The plant is grown to hip height, then prompted to flower. A boll develops from each flower. Within the boll is the burr, which is the cotton fibre and seed. The plants are defoliated before picking so that the harvested cotton contains much less twigs and leaves. The cotton is harvested once the bolls have fully opened. The harvested cotton is rolled into bales that weigh 2,500kg each. They’re so heavy a B-double truck can fit only 13 bales. Michael told me that Kilter need a 10 bale to the hectare harvest to break even. That’s a lot of cotton. The bales are driven to a cotton gin run by Auscott in Hay, NSW for the next stage of processing. Currently all ginned Australian cotton is sent overseas for spinning. There are no suitable yarn mills in Australia. Michael has some plans on how to change that, but they’re still in the beginning stages so we won’t see the results for a long time yet. The cotton is irrigated with a subsurface drip. 2016 was the third year that Kilter have grown cotton in Victoria. Their water usage over the three years tells the story of how they’re tweaking what they do. They used 10 mega litres of water per hectare in 2014, and reduced that by one mega litre in 2015. In 2016 they got it down again to 7 or 8 megalitres. The national average is 7.8 mega litres per hectare. Kilter Rural have been able to significantly reduce their insecticide use because of the variety of cotton they’re growing. The biggest change this variety of cotton brings is a significant reduction in insecticide use. The range of herbicides needed has also dropped. Michael was happy for me to visit the farm, so we drove all the way up to Winlaton, near Swan Hill. Ron Opie, the farm manager showed us around. We arrived a few days before harvest. I’ve seen photos of cotton fields before, but seeing the real thing was different. The cotton was super white and practically falling out of its casing cotton. The plants were shorter, and there was more cotton per plant than I imagined. Kilter Rural grew 240 hectares of cotton this year, and aim to get to 500 hectares eventually. Ron took us to the edge of the field, where some plants had germinated outside of the irrigation lines. Their growth had been slower, so he could show us a boll in the stages between closed and fully open. If the bolls are slow to open in the field, they use a horizontal bar to tap the cotton buds. This rap is enough to prompt them to release their fruit. At harvest time, a tractor will work 7 furrows at a time. It’s hooked up to GPS so the irrigation lines are unaffected. Cotton doesn’t give Ron many problems, in fact his biggest issue is the irrigation lines. A worm likes to chew through the plastic tubes. Ron’s team have to plug the holes quickly to stop water loss! Kilter Rural rotate crops. There were corn husks on the ground from the previous crop when we visited. They have found that tomatoes grow well after a cotton crop. Ron explained how just before sowing, he’ll allow weeds to germinate. These are then turned into the soil, which gives the crop an advantage on weedy competition. Kilter Rural participate in the Better Cotton Initiative. They value sustainability in their business and manage over 70 habitat hectares of remnant vegetation in the Victorian Riverina and Murray Fans bioregions. This covers grasslands, woodlands and scattered large old trees. Kilter Rural have also been involved in composting and carbon farming research projects. This is the longest journey I’ve made visit a farm for this Fibreshed project, but it was well worth the trip. Plant farmers seem to be a different breed to animal farmers, much more laconic and business-like. It was great to meet face-to-face and better understand the work that’s occurring here. “You need to talk to Ixchel bunny. She has the most amazing angora fibres!” I’d just told a friend that I was researching my Fibreshed project. Hers was the second recommendation I’d had. That meant I was already curious by the time I first met IxCHeL’s owner Charly. Charly is an eagerly anticipated fixture at many of Victoria’s fibre markets. I met her at the Handknitter’s guild fair in Coburg. She’s so friendly I had to wait in line to talk to her. Luckily for me, that meant I got talking to Wil, who’s been a great advisor to me ever since. Charly’s good at drawing good people to her. Charly cuddling a 10 week old English angora kit. This gets it used to handling, combing and clipping. I’d have loved to have visited Charly’s farm to check out her angora bunnies, but it would be too dangerous. Biosecurity on this type of fibre farm has to be extremely high to make sure the animals stay safe. Humans can be carriers of calici virus. This deadly disease, together with myxomatosis, is used in Australia to control wild rabbit populations. Unfortunately for domestic rabbits, the diseases don’t discriminate. Charly vaccinates against the strains of calici virus she can, but that doesn’t provide 100% cover. The myxomatosis vaccination is not permitted in Australia. Instead, I quizzed Charly about her work in order to write this post. She also provided all the photos below. Charly has lived in at least four different continents. Love brought her to Australia. She has a beautiful little property in the Yarra Valley with her partner Paul. It’s tucked away between the mountains with a lush green paddock, plenty of water and wildlife. The property’s small size means Charly can’t keep large livestock herds. Angora bunnies work here because they don’t need much space. It wasn’t just practical reasons that lead Charly to farm angora. She’s always felt an affinity with rabbits. Charly’s mother and grandmother were rug weavers, so she’s been immersed in fibre from a young age. The Ixchel Farm and the Little Yarra River. A rammed earth enclosure under the veranda of the farmhouse has become the perfect bunny dwelling. During the day the angoras run in their enclosure. At night they’re kept safe in their bunny night cages. Underneath the night cages Charly has installed worm farms. They catch and process the rabbit’s droppings. The results enrich the farm’s veggie patches. This loop feeds the humans and bunnies on the property. Charly keeps her herd under 100 animals and doesn’t breed to sell for pets. This gives her a sustainable number to cover the needs of her fibre business. Each of her rabbits has a name. Caring for angoras is very labour intensive. They need daily grooming and need their fur clipped at least every few months. Good grooming and maintenance helps reduce wool block. Charly’s herd has suffered several setbacks. Despite vaccinating against calici, a few years ago 75% of her herd was lost to a new strain of the virus. They’ve suffered from a different strain since then. They are currently on full alert because a new strain has been released. An additional new Korean calici virus strain is set to be released by the government this autumn. There are no new vaccines available. There have been reports of rabbit deaths in their local area. Charly hand dyes, blends and spins tops and yarns on farm. She blends her angora bunny fibre with Navajo churro, Australian merino, wallaby and other rare breeds. Angorino is her angora and Australian merino blend. Her products are unique and only available in short runs, so you have to get in quick. Check the Ixchel blog for product updates every Friday night at 8 pm AEST. She also offers subscription clubs. She works with Cashmere connections to do her bigger blends. IxCHeL is a great source of rare breed fibres from around the world, such as vicuña, guanaco, qiviut, bison and rare sheep breeds like the North Ronaldsay and Norwegian Gra Troender. Australia is the largest exporter of greasy wool for fine apparel in the world trading over 323 tonnes in 2013 (FAO, 2013.) Rachel Bucknall from Fibreshed Melbourne met with local wool growers Wendy Dennis and Tom from Tarndwarncoort who envision a much more local, connected future for their wool and the land. I took my mother to a sheep farm for Mothers’ day. In fact, I convinced two of my aunts and my grandmother to come as well. I freely admit the selfish impulse behind this invitation (it meant I could do some more research for my Fibershed project). What gave me confidence to propose this audacious plan was that the sheep farm was putting on high tea. Tarndwarncoort is under two hours drive from Melbourne, only a short way off the Princes Highway between Colac and Winchelsea. It is a working sheep farm that is also working hard to welcome visitors. 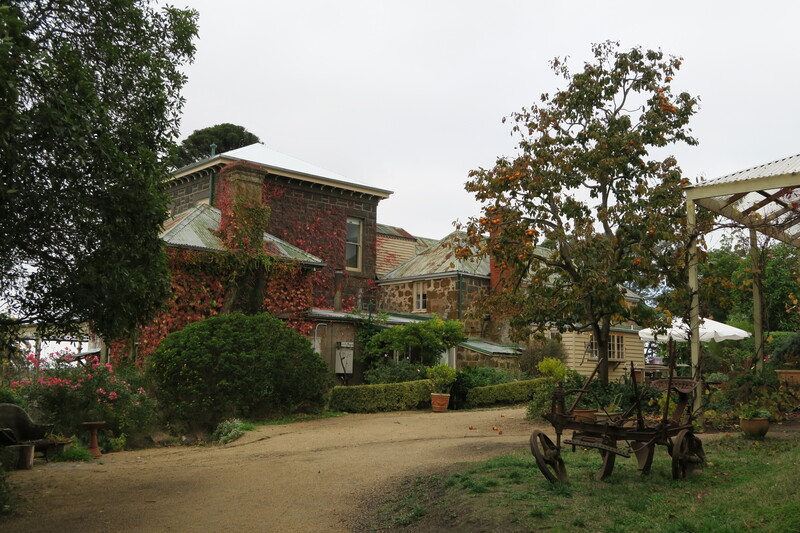 It offers boutique accommodation, a woolshop, a studio cafe, tours, and events. The beauty of the courtyard made us smile as we entered. Wendy came to greet us. We were early for tea, so she suggested we sit in the warmth of the wool shop. Tarndwarncoort wool is grown and processed locally, and while the majority is sent to New Zealand for fine spinning, a new local mill, The Great Ocean Road Woollen Mill has provided the opportunity to collaborate and begin production of a uniquely local product. Tarndwarncoort is the home of the Polwarth sheep; Australia’s first sheep breed. Wendy and I sat down so she could show me how the Dennis family breed this sheep. It’s telling that as she went on, more of my family stopped browsing to join us and ask questions. It’s an interesting story, and Wendy tells it well. The Dennis family arrived in the 1840s with a breed of Saxon Merinos. They discovered their sheep weren’t well adapted to the wet and cold environment of this area so Richard Dennis tried cross breeding. He crossed his Merinos with Lincolns, a heavy breed of sheep famous for its long but coarse locks. This first cross results in a Corriedale, which is New Zealand’s first breed of sheep. However Corriedale fleece is coarser than Merino fleece, so Richard experimented further. He bred his Corriedale back with a Merino. It is this cross that was eventually refined into the Polwarth breed. 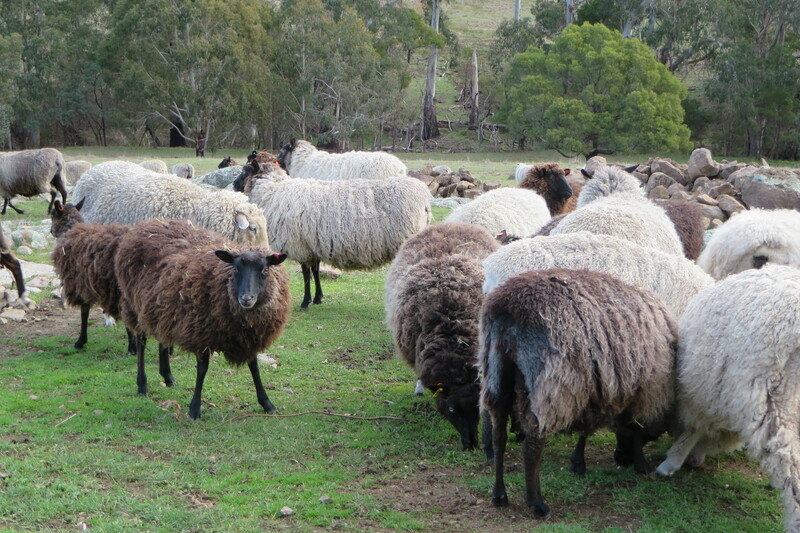 Polwarths have the hardiness and long staple length of Lincolns, but retain a lot of the softness of Merinos as well. At each stage of the story, Wendy produced a sample of each breed’s fleece. 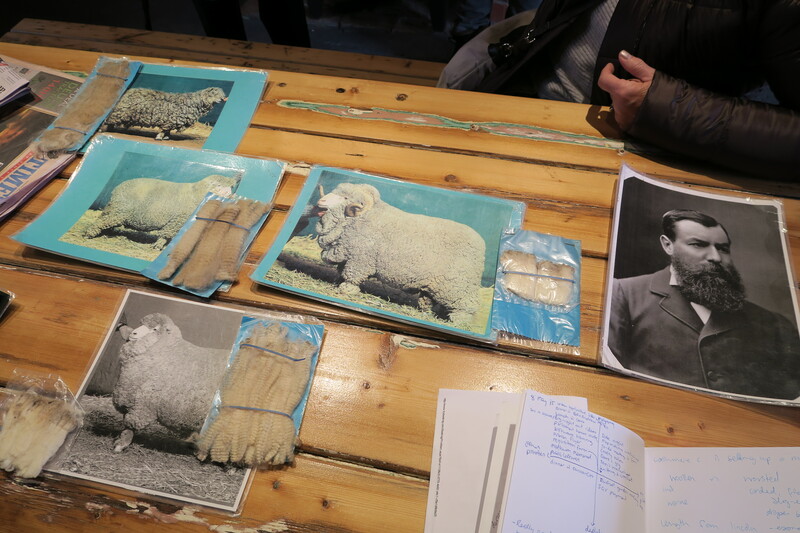 Touching the fleece of a Merino, Lincoln, Corriedale and Polwarth helped me understand the differences in each breed’s wool. Top left: a Lincoln sheep. Middle left to right: Corriedale, Merino, Richard Dennis. Bottom: a Polwarth sheep. Traditionally sheep farmers would selectively breed for white sheep, because their fleece can be dyed a wider range of colours. Occasionally recessive genes would reappear in black, grey or brown lambs, so these would be culled. Wendy began wondering if these coloured lambs could be useful in the 1970s. She kept them and her husband David bred up a coloured flock. Hand spinners and knitters loved coloured fleece, because they like the natural colours and don’t need to dye. Coloured fleece now contributes to a big part of Tarndwarncoort’s income. Wendy organises an incredible challenge each year to promote wool and raise money for cancer research. Its called the International Back to Back Wool Challenge. Each team of eight is challenged to blade shear a sheep from their country of origin, process and knit the fleece into a jumper within 24 hours! Australia currently holds the record at 4 hours 51 minutes 14 seconds. Let me say that again. A team managed to hand cut a fleece, spin it, and then knit a jumper in less that FIVE HOURS. Wow. We were eager to learn more, but it was time for tea. We were lucky to be seated in the gracious, well worn dining room. My family loved the antique porcelain display. I loved sharing a room with Angie Smales, who was playing zither to entertain us for the day. Angie played old songs like Greensleeves beautifully. She must have strong fingers, she played for over an hour! 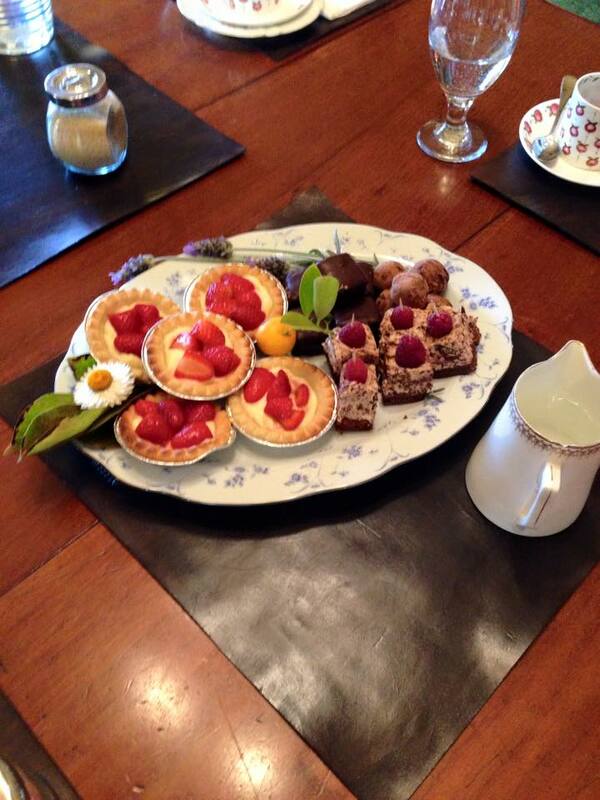 The food served was simple, home made and inventive. We’d never had savoury profiteroles before, but it’s definitely given us some ideas for our own creations! I thought the plates were beautifully arranged. They were decorated with trimmings from the gardens. In-between courses, Wendy and David’s son, Tom, took us on a tour of the homestead and gardens. The Dennis family has lived in this area for 175 years. Tom knows so much of his family’s history and has a wonderfully entertaining way of telling the story. 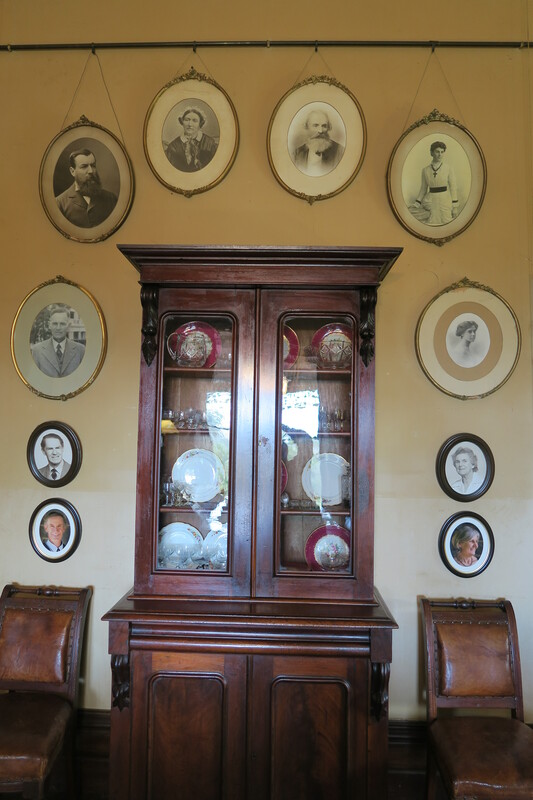 We started in the dining room, where photos of each generation of the family to have lived here hang. Tom can count back six generations and I could identify a lot with his story. My own family established a sheep run about 150km north of Tarndwarncoort a few years later. Tom then took us out to the gardens, which have a lovely old English feel to them. There is a water well with the bell hanging above. This came from the ship the Dennis family sailed out to Australia in. There is also a stone chair built out of the remains of the first homestead’s hearth. 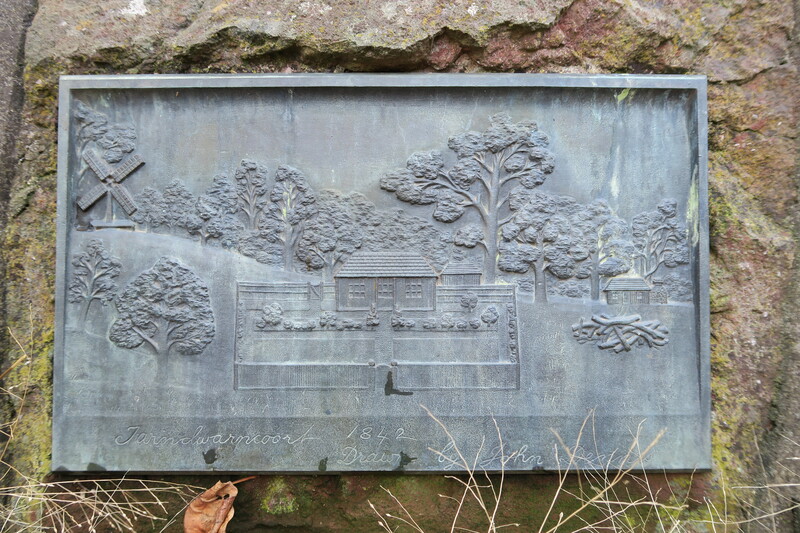 A drawing of that old homestead has been made into a brass plaque to show what it looked like. The family originated from Cornwall, and you can see the influence of their background on the homestead’s architecture. Tom pointed out where the house was added to as the family fortunes rose and fell over the years. Tom runs these tours to raise money for the maintenance of the house. So far he’s been able to modernise the wiring and gutters, a very important but expensive undertaking. My aunt quipped that Tom should consider having Country House Rescue to visit. Tom agreed, but said he was also a little scared of Ruth Watson! Tom’s dreams for the Homestead are to build it’s offering to visitors to connect with fibre production. 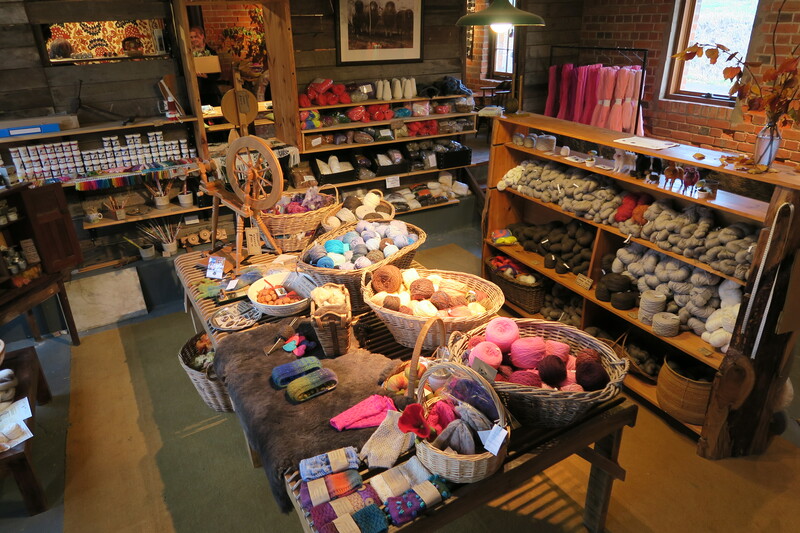 The historic site is uniquely placed to present an accessible experience of Australian wool in its production phase, and as a place to connect local artisans. Tom hopes that with a new regenerative farming and focusing on producing a unique product Dennis family can continue to produce 100% Polwarth wool well into the future. I made my goodbyes to Wendy before we left and thanked them all for their hospitality. My family talked about the day all through the drive home – we had a wonderful time! I couldn’t have hoped for a warmer introduction to alpacas than Fresh field alpacas. MaryAnn took me out to see the alpacas first. She knew all their names, and could call over those who were likely to be up for a cuddle. I got to see up close their gorgeous eyes and little ways they’ll tease each other. It’s pretty easy to see why people with a bit of space might consider an alpaca as a pet. Fresh field offer agistment services for those who don’t have the space to keep their alpaca. A couple were visiting their animals and giving them some treats when I arrived. Fresh field is an easy hour’s drive from Melbourne. The farm is friendly and set up for family visits. You can feed the alpacas for a small donation. 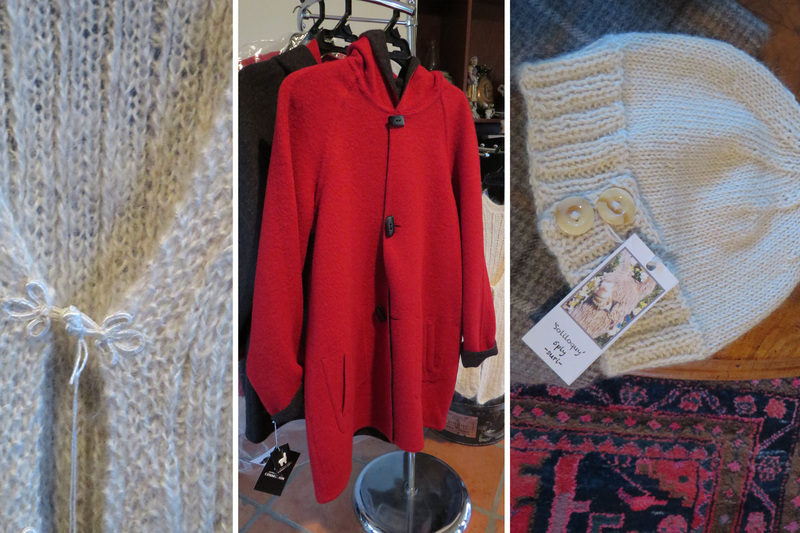 They also have a fairly large shop with a range of different alpaca products. Fresh field shear their alpacas once a year before the weather gets really hot. MaryAnn contracts a shearer and she said the most they’d done in one day was 86 fleeces! MaryAnn can wash, dehair and card the fibre on site. Their own fleece goes to different countries depending on the end product. Peru manufactures clothes, New Zealand spins most of the yarn in their store. MaryAnn gets fleece donations from people who’ve bought alpacas from her. She hand spins these or prepares them for felting. Did I hear you say felting? Yup! Fresh field has a farm studio and offers felting workshops. While I was there, the teacher was overseeing a more experienced felter. The felter had booked time in the studio to make some nuno felt pieces. 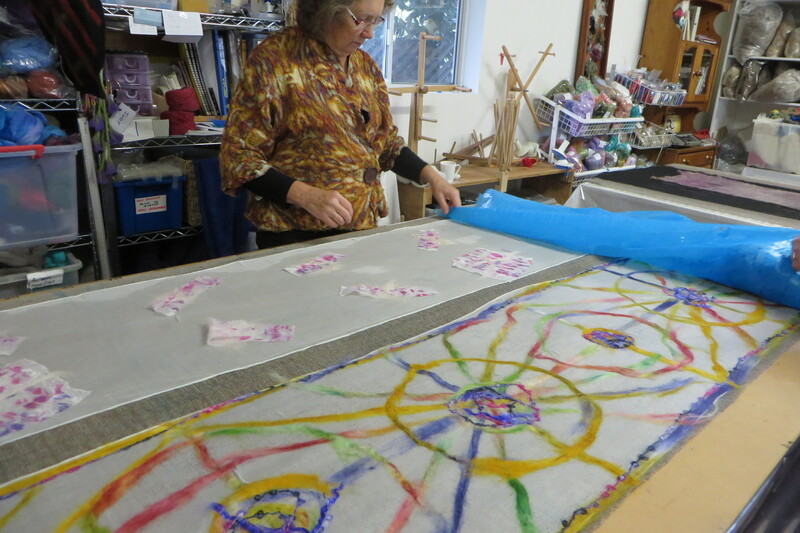 In the studio there are large tables and a felting machine with fabrics and dyes on hand. I can see the attraction of working in the studio compared to trying to work at home. Judy is the teacher. She’s skilful and practical, with a cheeky sense of humour! She also runs classes where you can learn how to create a hat, bag or scarf. I’m planning on coming back for a felt hat workshop. Judy’s examples of felt hats in the store are lovely (sorry, I didn’t think to take a photo – silly me!). It was hard to keep my eyes on the road as I drove into Red Hill. It’s such a pretty, rolling green hills kind of a place. Jean at Pitchingga Ridge had warned me that Google maps sends you the wrong way to their farm. I made sure to ignore my GPS and enter from Mornington-Flinders road. The farm is on the unsealed, but well maintained Stony Creek Road. My little rental Corolla handled it easily. David met me first, with Abbie the kelpie. He brought me over to meet the alpacas, including a cria (baby alpaca) that was only two hours old! 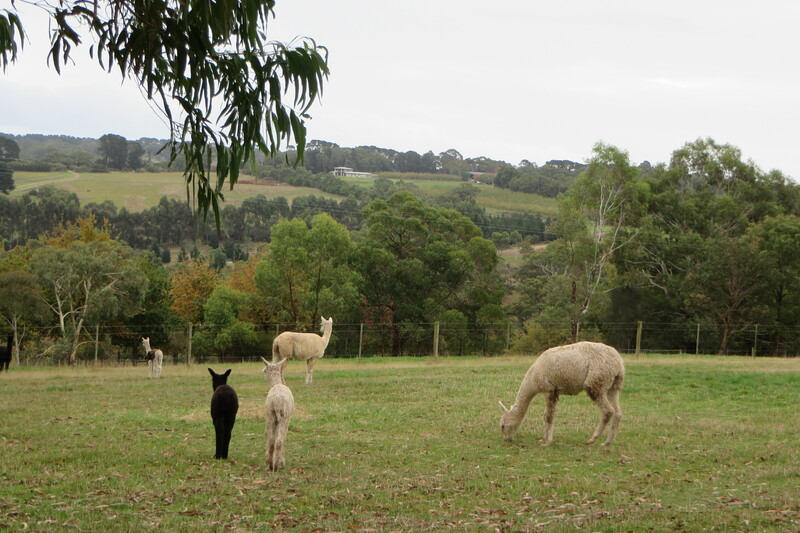 Pitchingga Ridge keep huacaya and suri alpacas. They graze together in a beautiful setting. Jean had told me she had another visitor coming. Soon after I arrived, a family drove up, cradling a limp cria. Jean inspected it with an experienced hand. She suspected hypothermia and called a vet. They bundled the baby in a blanket with hot water bottles and hand fed it a sugar solution. Jean told me she couldn’t do much, but I could see the family were grateful for her advice. I learnt that Pitchingga Ridge is part of Q-alpaca. This voluntary program reduces the risk of disease entering or spreading from a property. With this in place, the alpacas at Pitchingga Ridge don’t need as much medication. There is a designated vet for the program that audits their property each year. Jean and David are members of the Australian Alpaca Association. Hearing their stories helps me understand how important associations are. They work to improve and promote their industries. They also support the individuals working within them. Jean showed me reports on each of their fleece alpacas. These reports reveal the average micron (diameter of the fibre) and deviation from that average. These numbers measure the quality of each fleece. It was impressive to see the steps they take to produce a high quality product. I was surprised to find the reports interesting. I usually shy away from ‘dry’ numbers! I left much later than I intended, warmed by many cups of tea and lots of stories. The family with the sick cria had left before me. I heard that the baby was showing good signs of getting better. Jean, David and Abbie the dog waved me goodbye as I left.